As we gear up to gift to our loved ones cards and flowers this week, those of us in Arizona are also recognizing the state’s 107th birthday on Feb. 14. Arizona became the 48th state in 1912. Prior to that, the region was considered a territory of New Mexico. Today, Arizona is home to more than 7.2 million residents (according to the U.S. Census) and with more than 114,000 square miles, the communities are as diverse as the landscape. 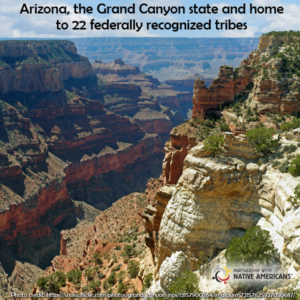 In fact, Arizona is home to 22 federally recognized Native American tribes and the third-largest population of Native Americans in any state. The indigenous people in Arizona account for more than 10 percent of the more than 2.7 million Native Americans in the U.S. Many of these Native American reservations border the state’s major cities (Phoenix, Tucson, Flagstaff and Yuma), so it’s not unusual that Native American customs and traditions have had a significant impact on Arizona culture. Whether it’s rows of custom turquoise jewelry at the annual Arizona Indian Festival or ancestral Native pottery displayed inside the Arizona State Museum, you don’t have to go far to find the Native American influence. Even the name “Arizona” derives from an Uto-Atzecan Indian word meaning “little spring” in the Tohono O’odham language. This month, we encourage you to learn more about the history and heritage of Native Americans in Arizona. If you’re local, plan a weekend outing to the Pueblo Grande Museum & Archeological Park or day trip to the Hopi House near the Grand Canyon. You can also pick up a copy of Native Americans of Arizona or Traveling Indian Arizona to plan an authentic trip to the Grand Canyon State. This entry was posted in Humanitarian and tagged Apache, arizona, Arizona Indian Festival, Arizona Stat Museum, Grand Canyon, Hopi, Mohave, Native Americans, Navajo, Pima, Pueblo Grande, Valentine's Day. Bookmark the permalink. Trackbacks are closed, but you can post a comment.